Sugg, Fulton, and Anderson begin their attack on Horseshoe Ridge. 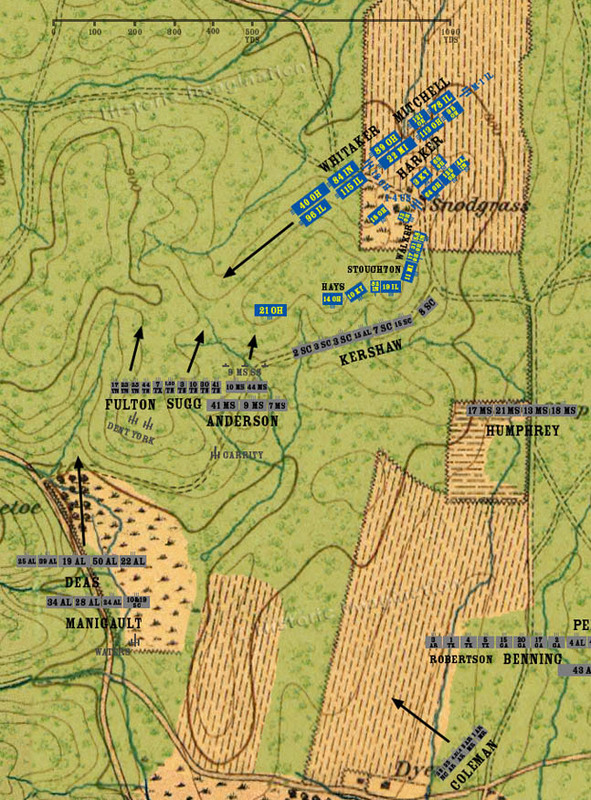 The repeating rifles of the 21st Ohio bring Anderson’s Brigade to a halt on the slopes of Hill Three. Johnson’s skirmishers easily gain the crest and outflank the 21st. Although General Thomas had originally contemplated sending Steedman’s division to fill the gap between the forces on Snodgrass Hill and Kelly Field, the sounds of fighting at Hill Three led him to order Steedman’s men to the right. Deas and Manigault move to connect with the left of Johnson’s Division. Coleman’s brigade begins marching to reunite with Fulton and Sugg.